Before the Victorian era, fireplaces tended to be made from cast iron with no colourful embellishments. However, in the early 19th century, fireplace manufacturers began to experiment with tiling on either side of the grate, coinciding with the increase in wealth of the UK due to industrialisation. Because there were so many designs of tile available in a variety of colours, it allowed the owners to match the shade and pattern to the fixtures and fittings of their rooms. This choice meant that the fireplace became a centrepiece of a room rather than simply a heat source. After Queen Victoria’s death, designs became less ornate and more geometrical, leading to the clearly recognisable shapes used in Art Deco, or Art Nouveau designs. We stock many variations of tiled grates, from the Victorian styles like this Celtic-themed, tiled fireplace, to the later Edwardian alternatives, such as this tiled fire grate. We also have a number of Art Nouveau examples, like this Scottish grate manufactured in the Carron Iron Foundry in Falkirk. 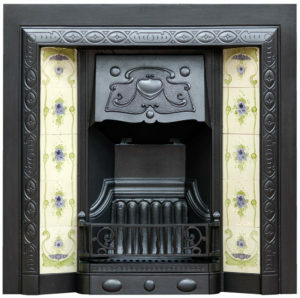 To aid you in your choice of fireplace, we stock over 100 sets of antique Victorian, Edwardian, and Art Nouveau tiles. Whichever one appeals to you can be fitted onto any of our tiled fireplaces. Once you have placed your order, your selected tiles will be securely fitted to the grate of your choice, allowing an immediate installation once the fireplace has been delivered to your home. Our service is second to none as we use specialist fireplace delivery agents, and can recommend fully registered and trustworthy fitters for complete peace of mind when installing your fireplace. So if one of our designs has caught your eye, please contact us on tel:01612258967 or use our online contact form.